Carrot Cake Power Cookies! 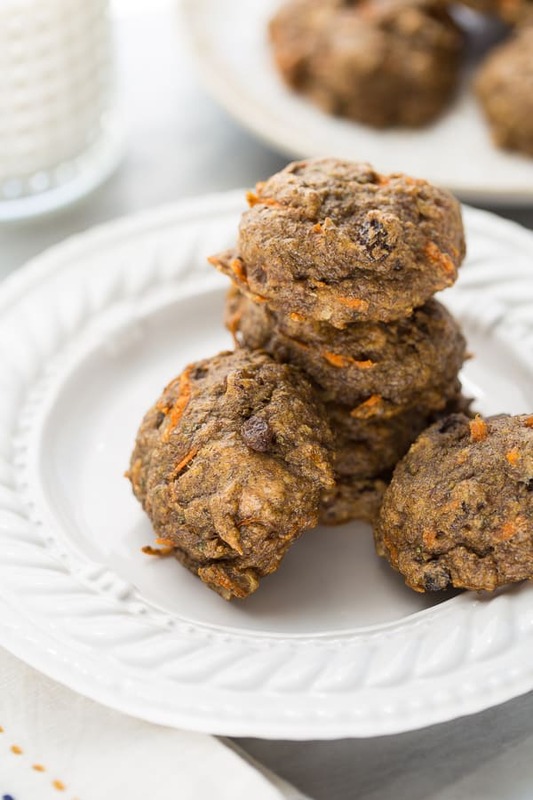 Healthy, gluten-free and vegan breakfast cookies that are full of superfoods. Delicious and kid-friendly! I just survived 8 days of my husband being out of town while my kindergartner was on spring break. So I’m sitting here happily typing this post as my husband puts the kids to bed which feels so refreshing after a week of doing it all! He had to go to a conference in Houston and also visited his brother for a few days. We totally missed the fact that spring break coincided with his trip because we’ve been so distracted selling our home and getting ready to move across the country. We forgot about spring break! Even with Daddy gone we tried to make the most of our stay-cation spring break. The boys slept in until 8:30-9 everyday (bless them!) and we did some fun things around here in Utah. However, I severely underestimated how crazy and crowded places like the children’s museum can get over spring break! I thought how bad could it be in the middle of the week last week? The answer was very, very bad. Lesson learned! We stuck to parks and playdates instead of crowded public places the rest of the week. One of the things that saved me with single-mom spring break was meal prep. It is the worst to get hungry (or hangry!) when you have a busy day with the kids. I made a big batch of gluten/dairy-free lasagna the night before my husband left as well as some turkey sweet potato hash. It was so nice to not have to cook or get a bunch of dishes dirty every night. 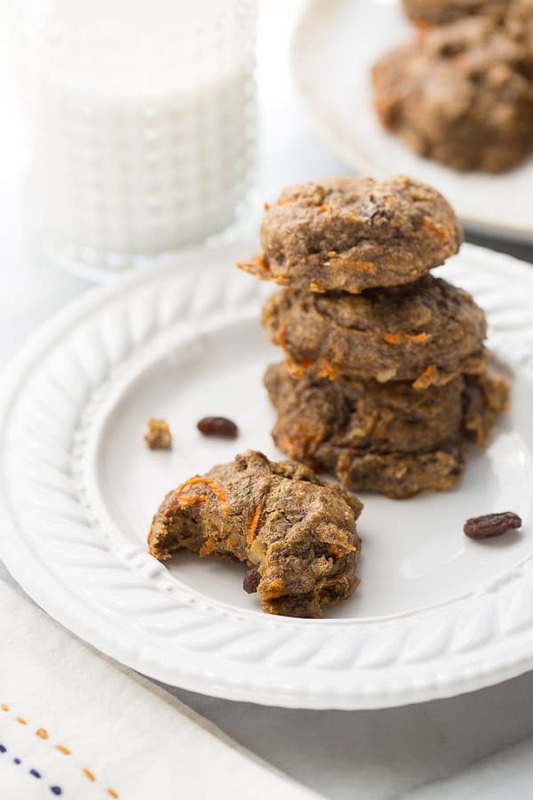 These Carrot Cake Power Cookies are one of my favorite things to make for breakfast for busy weeks. I can eat eggs, so not many of my baked goods are totally egg-free, but these cookies have a magical fluffy texture despite being totally vegan. They are full of healthy fats and superfoods like chia seeds, flaxseeds, walnuts and almond butter. They are also naturally sweetened with a little maple syrup and applesauce. In addition to being full of protein and fiber, these cookies are also totally kid-friendly! My toddler loves them and I love that he is getting so much goodness in a cookie. For busy weeks like we had last week, you can’t beat having 1 or 2 healthy cookies for a fast breakfast! 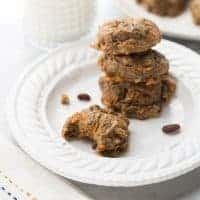 I also love these Banana Oat Breakfast Cookies, but if you’re looking for a paleo option these cookies are also grain-free! Preheat the oven to 350F. Line 2 baking sheets with silicone baking mats or parchment paper. Combine the ground chia seeds and hot water. Let sit for about 5 minute while you measure the rest of the ingredients. 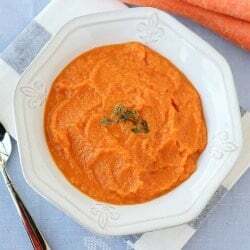 Place the cashew butter, flaxseed, arrowroot powder, applesauce, maple syrup, lemon juice, cinnamon, nutmeg, ginger, salt and baking soda in a bowl. Use a hand mixer to evenly combine. Add the chia seed mixture and mix until totally smooth and incorporated. Add the carrots, raisins and walnuts and mix to gently combine. Using a cookie scoop or wet spoon, scoop the cookies out onto the prepared baking sheets. Use wet hands to flatten slightly if desired. Bake for 15-17 minutes until golden on the edges and bouncy to the touch. Let cool for 2 minutes then transfer to a wire rack to cool completely. Enjoy! Same boat over here!! My husband is on a business trip and it’s spring break, but only for 3 days, I can’t imagine 8. gah! You are so smart to meal plan. I WAS doing whole 30 dinners up until he left and now I’m just shoving cookies in my face. Too bad they’re not these ones!! Can I use whole chia seeds? If not how do I grind them? The texture won’t be the same with whole chia seeds unfortunately. I grind them in my blender about a cup at a time (you have to grind a bigger amount to get the blender moving). What is the nutritional value of these cookies? I calculated out the calorie count. It shifts depending on type of nuts (cashews have less calories than almonds) and starch (couldn’t get a number on arrowroot, but tapioca starch is 148cal/.5cup, and cornstarch is 244cal/.5cup) used. Ballpark batch of 15 cookies: 148 calories each, 20 cookies: 111 calories each. Can arrowroot powder be subsituted with something else? You could try tapioca starch or potato starch! Let me know how it works if you do. What’s the nutritional value for the cookies? They look delicious, can’t wait to make them today! No puedo resistirme a comentar!!. Excelentemente escrito! Hi Erin,I have just made these cookies at midnight here. As I had all the ingredients and it was my experiment moment.Absolutely delicious.I have had 5 cookies 🙂 My kids will get to try later today and will be added on the school treats. Their classroom has no refined sugar policy which I love. I used food processor. I used honey 1:1 instead of maple sugar and lime instead of lemon. The chia seeds give nice texture for soft cookies. So glad you liked them! Great to know about those substitutions! These look amazing! Can eggs be subbed for the chia seeds, and how many? I haven’t tried these with eggs so I’m not sure! I don’t like raisins; would you suggest substituting something else or just excluding them entirely? Thanks! You can omit them or use another dried fruit like cherries or cranberries! I can’t wait to make these all the time. There’s not a better take-on-the-go breakfast treat. 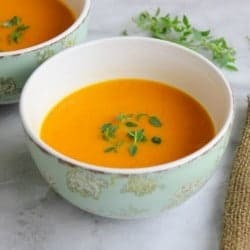 Can I substitute the chia seeds with flaxseed? 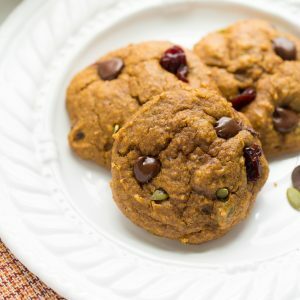 The carrot cookies are the nutritional facts and calories per 1 cookie or per batch?